Watford ended a six-match winless run in the Premier League but were made to sweat as Cardiff City mounted a late fightback in a 3-2 win at a sodden Vicarage Road on Saturday. Javi Gracia's side had managed only two draws in that run – both on the road at Southampton and Everton – but were in total control for 80 minutes against Cardiff and opened up a 3-0 lead through Gerard Deulofeu, Jose Holebas and Domingos Quina. Deulofeu's 16th-minute opener came after a determined solo run from the Spaniard, before Holebas and Quina stretched the lead with a pair of wonderful second-half strikes. Junior Hoilett netted what appeared to be an 80th-minute consolation for the visitors - another stunning curler - and Bobby Reid set up a tense finish two minutes later, but Watford clung on for the win. 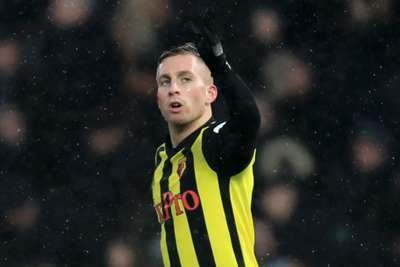 Having had to settle for a place on the bench in Watford's last two fixtures, Deulofeu appeared keen to impress from the start and quickly unlocked the Cardiff to defence only to curl beyond the far post as he looked to find the net from a tight angle. Undeterred, it was the Spanish attacker who broke the deadlock. Deulofeu ran at the heart of the Cardiff back line from midway inside the visitors' half and danced between two defenders before coolly slotting past Neil Etheridge. After conceding the opener, Etheridge became key to keeping Cardiff in the contest, as Watford continued to find gaps in the defence. Having denied Roberto Pereyra from close range in the 43rd minute, the Philippines international produced a spectacular save to keep out a curling free kick from the Watford forward in the final action of the half. Etheridge produced another good save from a Pereyra shot after the restart but he was finally beaten for a second time when Holebas curled in a beautiful left-footed strike from the edge of the box in the 52nd minute. Quina's first Premier League goal gave the scoreline a deserved convincing gloss as he beat Etheridge with another perfectly placed shot from the edge of the penalty area, but the match was far from over. Hoilett's stunner with Cardiff's first shot on target robbed Ben Foster of his clean sheet and Bobby Reid stabbed home after Watford failed to clear their lines from a corner. But Watford managed to see out the remaining eight minutes to secure a victory that should have been far more comfortable. 82 - Wow! After a goal-mouth scramble Bobby reduces the deficit from close range. The result lifts Watford to ninth in the Premier League table after defeats for Leicester City and Bournemouth opened the door for them to climb into the top half. Cardiff drop to 16th, four points above the relegation zone. Deulofeu's goal settled the home side early on and also set the precedent for future attacks, with Gracia's men creating further chances by playing through the centre of the Welsh club's defence. He then set up Holebas for the second and was also involved in the build-up to the third. The fact Cardiff were able to make a contest of the closing stages owed a lot to the earlier work of Etheridge. Despite conceding three goals, he comes out of this game with his reputation enhanced. - Cardiff scored twice in an away Premier League game for the first time this season, last doing so in March 2014 vs West Brom (3-3). - Watford (2) vs Cardiff (1) was the first Premier League match to see three goals scored from outside the box this season. - At 19 years and 27 days, Quina became Watford's youngest ever Premier League goalscorer. - Holebas has been directly involved in more goals than any other Premier League defender this season (7 – 3 goals, 4 assists). - Deulofeu scored and assisted in the same Premier League game for the first time with Watford, last doing so in November 2015 for Everton against Sunderland. - Hoilett has scored two goals in his last four Premier League games – more than he’d managed in his previous 61 in the competition (1). Watford visit West Ham on December 22 in their final fixture before Christmas, while Cardiff host Manchester United on the same day.